Bridgnorth has seen the arrival of two sections of 82045’s boiler barrel, and once space is available in the boiler shop one section will be swaged to fit the other so that they can be riveted together – this slightly complex arrangement is described in more detail in the November news update. Elsewhere on the locomotive, the cab is now off the chassis and partially dismantled for the drilling of holes to fit other components to. The bulkheads behind the driver’s and fireman’s seats have been assembled and fitted. Fitting of the cab is expected in the new year. At the front of the engine, a new chimney and vacuum ejector exhaust ring have been manufactured by the Boro’ Foundry, the smokebox dart has been machined and handles fitted, and the vacuum and train heating pipework has received attention, as access to complete this job will be difficult once the pony truck is in place. At the rear, swing links for the suspension of the rear pony truck have been delivered, after manufacture in collaboration with the 2MT project at the Bluebell. Financially, the project’s Boiler Appeal remains healthy, having reached over £200,000 by this autumn. Next year’s Eardington Flyer special train on the SVR is being organised as part of a final push to fund the last major set of components, the motion. Interestingly, the project reports in its end of year round-up (published with the December engineering update) that donations over both the spring and September gala weekends were substantially up on previous years, this being the first time the cylinders and bunker were available for display – being demonstrably on course for completion appears to generate both interest and revenue at increased rates for new build projects. The 77021 group is progressing with the manufacture of its initial components: they now have the smoke box door distance piece (the first casting from their pattern having gone to 82045), ready for machining in the new year, and the dart for the door is ready for collection at the East Lancashire Railway in Bury. Five components for the frame assembly were ordered by December: the frame stretcher, left and right motion brackets, boiler carrier and smokebox saddle. Quotes have also been sought for the casting of the exhaust steam spider, the existing pattern for which has been deemed not to be suitable. The option of sand printing is being seriously considered, as an alternative to wood or poly patterns: this involves creating the sand mould by 3D printing. Prominent elements at the front and rear of the P2 have recently been created. The cab has been temporarily assembled, upside-down in a specially made cradle, and will be riveted together after grit blasting and priming. The smokebox door has also been made, which posed special challenges: the D-shaped door of the P2 cannot be made using the spinning technique used for round smokebox doors on other locomotives, and the team was keen to use a method that would secure a high quality finish for such a prominent component. Impressed by the quality and finish achieved on firebox components by South Devon Railway Engineering, they secured a quote for a process using specially created pressing tools. This news post is well worth reading in full for both a detailed description of the process and some spectacular photographs. Elsewhere on the locomotive, progress includes machining and delivery of the front boiler support and pony truck top centre casting, and the removal for grit blasting and priming of the distinctively shaped footplating, prior to final fitting to the frames. Fundraising has also entered a new phase, with sponsorship of individual components being made available to the general public for December only, in a special Christmas promotion. After this, sponsorship will revert to being available only to monthly covenantors and members of the Founders Club. The latest engineering update from the Patriot group largely covers events up to the end of October as previously reported, but numerous specific items of progress have been reported on social media. These include the fitting of the cylinder valve liners, the casting of brake hangers and their machining, and the machining of the big end strap, which will fit the inside con rod from Jubilee 45697 Achilles. This Christmas message on Facebook reiterates the aim of steaming the locomotive in 2017 and heading a train into London on November 11th 2018. The F5 project reports that it is discussing its boiler specification with insurers Sun Alliance. It is also researching what valve gear drawings are applicable to the class via the NRM’s Inreach service, in order to identify the correct motion bracket design and complete CAD work on the frame plates. On the organisational side, the project has been joined by Stafford Road Design, who have worked on five other new build projects including Betton Grange and the Night Owl, and has launched a fundraising campaign urging supporters to consider leaving a legacy in their will (below). 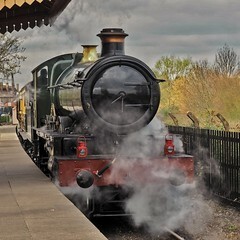 As ever in the contexy of charitable fundraising, legacies are a difficult subject to broach but can be a hugely important source of funds, although giving such a high profile to this aspect of fundraising does appear to send the message that completion of the locomotive cannot be expected within the next few years. As a result of moves within the works at Didcot, all of the elements of 1014 are now on its road number 4. Work is progressing on both the tender and locomotive. On the frames, the areas that will be behind the driving wheels are being prepared for painting; the wheels themselves will require some cosmetic attention before rewheeling. Following the meeting in August at Crewe about the boiler, a further meeting on the same subject was due with insurers before the end of the year. The project’s ‘scout’ is reportedly speaking to possible sponsors of the boiler, for which the two barrel sections, smokebox wrapper and front tube plate are due to be manufactured in 2016; sponsors are similarly being pursued for the inside and outside motion, and eccentric sheaves. The Boro’ Foundry are preparing for manufacture of the superheater (if NBS is reading the latest news update correctly), using sand mould printing techniques (as also seen above, on Hengist). On the tender, progress includes the riveting of the spring hangar brackets and completion of most of the timber packing for the base. The group are still looking for another machinist, but have had some success in attracting interest for their new welder role. After a relative lack of news updates during 2015, the Night Owl project has broken cover online to announce that, with the fitting of the extension to the donor frames, 4709 has come into being in its own right. An examination of the cylinder block in position by the frames suggests that it aligns well as hoped; an inspection suggests it had little wear in its working life and is in good order. A hydraulic test will be carried out before it is bolted to the frames. Meanwhile, ultrasonic testing of the donor wheelsets has confirmed that the axles are all sound. Work to complete the locomotive’s full wheelsets will cost an estimated £30,000, after which the project will turn to the wheeling of the engine. This photo on Twitter shows 567’s con rods after being painted and blasted at the project’s GCR Nottingham base. The Doncaster P2 group have updated their website and changed the URL (see links on right). Over on their Facebook page, meanwhile, they have published this CAD image of the pony truck. The latest update from Shildon is that the G5’s front wheelset is complete and now back with the rest of the locomotive; the other driving wheels and pattern have been returned from the Boro Foundry. This photo on Flickr appears to show this situation at the project’s base. The Brighton Atlantic‘s connecting rods are now in place, ready for the process of setting the valves, a process which involves rotating the driving wheels by hand and taking measurements as the pistons and valves move. While Tornado’s operations have continued smoothly in the latter part of the year, the A1 Trust announced the sad news of the death on November 10th of Dorothy Mather, widow of Arthur Peppercorn, aged 99. Their tribute to her can be read in full here. A project has been announced to build a ‘rolling chassis’ for a Black Five with British Caprotti valve gear, as fitted to the final two examples of the class, 44686 and 44687. The stated aim is to create a chassis to which a boiler could then be fitted, although the proposed approach towards obtaining a boiler is not set out on the project’s website. Volunteers for almost all key positions in the project are being sought. New Build Steam will report further on the project if it makes progress. Thanks to the reader who flagged it on Facebook. There have been significant developments in respect of mainline steam operations since the last New Build Steam news round-up. Firstly, on November 25th the Office for Road and Rail (ORR) prohibited West Coast Railways (WCRC) from operating steam trains on the rail network, following an initial investigation into an incident near Doncaster on 2 October 2015 which found staff on board Black Five 45231 had turned off its Train Protection and Warning System (TPWS) isolation equipment. Locomotives carrying equipment modified so as to prevent this action being taken were however permitted to continue in operation. Then, on December 9th, ORR announced that it would be prosecuting both WCRC and the driver involved over the signal passed at danger by Tangmere on March 7th. The first hearing is due to take place at Swindon Magistrates’ Court on 11th January 2016. The ORR is also reviewing WCRC’s safety certificate, without which it cannot operate on the main line. 5.ORR is working with the industry to ensure the sustainability of heritage operations on the mainline railway. In July 2015 we hosted the first of a series of summits which brought together the rail industry, engineers and safety experts. 6.The industry agreed there is a clear need to review many of the standards applicable to heritage operations. A group, chaired by RSSB will review the standards, which include maintenance and fitness-to-run procedures, competence requirements for maintenance staff, fitness-to-run inspectors and owners’ representatives. In addition to this review, Network Rail is working with train operators to develop train weight and length schedules for those routes deemed suitable for heritage operations. The review of standards relating to main line heritage operations may prove in the long term to be the most significant of these announcements, certainly for new build projects. While some of the locomotives covered on this site are being built avowedly for heritage lines, many large projects are underway on the assumption that there will be a main line network available for these machines to stretch their legs on. Safeguarding the long term future of mainline steam is therefore important, and hopefully this review will be an opportunity to do this by establishing a durable and clearly understood framework for its operation. The circumstances in which the review arose may of course mean that it poses some risks as well – the enormity of what would have happened in the event of a collision on March 7th cannot be overlooked – but overall the basis of rail operations in the UK is to allow flexible access to the network by different train operating companies, and there appears to be adequate good will within the industry to allow steam operations to continue to make use of this. What is less clear is whether the scope of the review will extend to operations on preserved lines, although the wording appears to allow for that possibility. The specific mention of a review by Network Rail of train weights and lengths may prove significant too: with the NRM’s report into the future of Flying Scotsman also addressing this issue, we may see more rigid restrictions on train length in future – this may pose a commercial challenge for promoters, but probably not sufficient to jeopardise main line railtours entirely. We await the outcome of all the ongoing processes with interest. By the time the next new build locomotive arrives on the main line they should be largely settled, and will have created the environment in which the locomotives whose construction is covered here will operate. It looks hopeful that next year, 2016, will be the last year for some time in which we will be unable to report that a new standard gauge steam locomotive has moved under its own steam. With that in mind, we have plans afoot to build up to a new era of projects reaching completion by improving the variety and frequency of content on this site – expect to see some changes around the middle of the year, although news round ups will continue to be every other month between now and then. If you use social media and do not already follow New Build Steam, remember that you can find us on Twitter, Facebook, Google+ (still!) and Flickr. Contributions to the photo pool on the latter continue to be welcome – these snaps of the 2MT chassis on the Bluebell and refurbished Clan cab are the most recent additions. That brings us to the end of 2015. We would like to wish every project further success in 2016, and all of our readers a peaceful and prosperous new year. I notice there is no coverage of LNWR George the Fifth class new build ‘Prince George’ 2013. The full smokebox is very close to completion (it is being riveted together). The front bufferbeam was manufactured last June. This is in addition to the front frames and a twenty foot section of the the side of the locomotive incorporating splasher and lower cabside which was produced in 2013, The LNWR George the Fifth Steam Locomotive Trust has also secured the future of an LNWR full brake coach which will provide a storage facility for the project and ultimately a valuable historical asset to complement. Aprofessional study of the impact of the current main line loading gauge on the draughting of the locomotive is also in progress. It is expected the the order for the casting of the four bogie wheels will take place early in the new year. I also note that there is no coverage in your report on ‘Spirit of Sandringham’ (B17 Steam Locomotive Trust), another serious and important new build. Paul Hibberd, Trustee, LNWR George the Fifth Steam Locomotive Trust. Many thanks for the update Paul – good to hear work is progressing. Are those details in the public domain somewhere that I’ve missed? I checked your website, but the news section hadn’t been updated since March (at least, as it displays in my browser). Ditto Spirit of Sandringham – again, allowing for the possibility that I’ve missed it, there’s been no update of any substance publicly in the last couple of months. Happy to take news updates by email if you want to be sure of having them featured – as you’ll have gathered, towards the end of even-numbered months is the time to aim for. Thanks for your excellent summaries of how the various projects are progressing. Always interesting and informative. Looking forward to 2016 and the expected advancement of these engines.